EU (Birds and Natural Habitats) Regulations 2011 make it an offence to plant, disperse, allow dispersal or cause the spread of listed species such as Japanese Knotweed (Fallopia japonica). 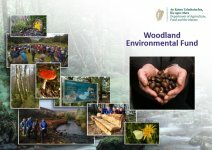 A list of Invasive Species in Ireland can be found on www.invasivespeciesireland.com. Sightings of invasive species can also be reported on this website or on the website http://records.biodiversityireland.ie/record/invasives. Japanese Knotweed (F. japonica) is native to Japan, Korea, Taiwan and China, is now widespread in continental Europe and Britain. Knotweed is suited to a wide range of conditions, including full shade, high temperatures, high salinity and drought. It is found near water sources, such as along river banks, low-lying and disturbed areas. It can colonise coastal shores and islands. Japanese Knotweed is a threat in open and riparian areas where it speads rapidly to form dense stands, excluding native vegetation and prohibiting regeneration. This reduces species diversity and alters habitat for wildlife. Once stands become established, they are extremely persistent and difficult to remove. Himalayan Balsam (Impatiens glandulifera) is native to the western Himalayas but is now invasive in many parts of continental Europe. It can form dense monospecific stands where individual plants can reach 2 – 3 m in height (one of the tallest annual plants in Ireland). The stem of the plant is smooth, hairless and hollow. They grow upright, easily broken and are usually purple in colour with many large oval-shaped pointed leaves bearing teeth around the edges. The flowers of this plant can vary in colour but are usually shades of white, pink or purple. Flowering usually takes place from June to October. Seed capsules arise where the flowers were and when mature and dry, the slightest touch causes these fruits to split open explosively dispersing seeds up to 20 feet from the parent plant. Seeds are capable of further dispersal by water and animal and human aid. Giant hogweed (Heracleum mantegazzianum) can colonise waste land and river banks (riparian zones) and can produce a dense colony growing up to 5m high as well as producing 30 to 50,000 viable seeds per year.It is a member of the parsley or carrot family, Apiaceae. It is a large herbaceous plant and can be either biennial or perennial. It can easily disperse seeds downstream and spread the growth quickly along the length of a watercourse. Like many non-native invasive plants it has built in defense mechanisms, if the plant is cut down before it produces seed, it will survive into a third or subsequent season, attempting to flower each year. Plants are generally capable of flowering and setting seed only once in a lifetime (termed monocarpic). The seeds produced are easily dispersed by wind, water, animal or human influence. The seeds can start to sprout in early spring and can continue to do so throughout the growing season. Seeds are known to be viable for several years. The tall stem produced is rigid and hollow, up to 10cm in diameter with purple blotches on the surface. The leaves are deeply lobed and sharply pointed with soft hairs appearing on the under surface. Flowers are white and borne in clusters on a large umbrella shaped head. Giant rhubarb (Gunnera tinctoria), sometimes referred to as Chilean rhubarb, can be found around coastal cliffs, waterways, roadsides, wet meadows and derelict gardens and fields. Gunnera tinctoria or giant rhubarb is not related to rhubarb, but as its name implies it is similar in appearance. This is a much larger plant with thorny leaves and stems. This is a large herbaceous plant that forms dense colonies and shades out other plants. This plant is most conspicuous in spring and summer when it can grow up to 2m tall with large 'umbrella' shaped leaves that arise from sturdy stalks or petioles. Gunnera over winters as large buds accumulating on the rhizomes (roots) above the surface, while the leaves die back, exposing these buds. Rhododendron (Rhododendron ponticum) is native to both Europe and Asia and was first introduced to parks, gardens, and demesnes in Britain and Ireland in the 1700’s. Rhododendron ponticum is readily recognised by its distinctive attractive flowers and large dark green coloured, oval leaves. It can grow quite tall with specimens regularly attaining 8m. Habitats for Rhododendron include: Mixed deciduous forest, temperate heaths and raised and blanket bogs. Rhododendron can form very dense thickets and out-compete native plants for space and resources, especially for sunlight. Other impacts on fish and invertebrate communities have been recorded. Rhododendron can also prevent access to sites by the shear mass of plant material blocking paths and right of way.